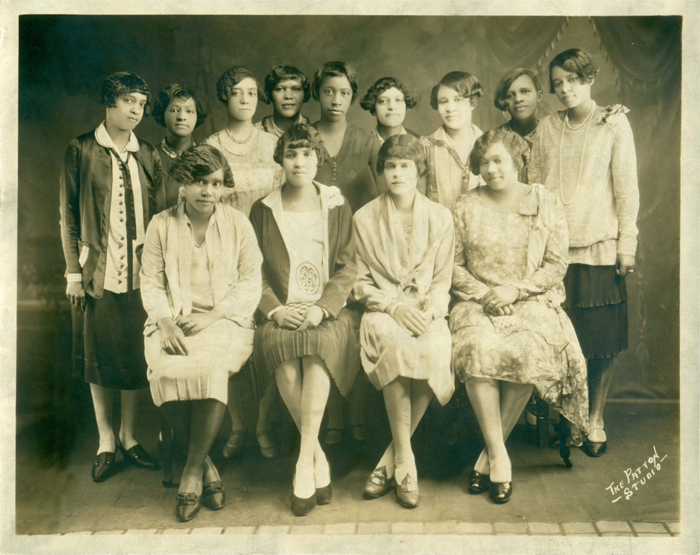 Sisterhood: A Look In The Past, As We Prepare For The Future | Omicron Eta Chapter of Sigma Gamma Rho Sorority, Inc.
Alpha Chapter 1924 – (Seated Left to Right): Delight Hinton, Maude Flack, Vivian Marbury and Georgetta Bardwell. (Standing Left to Right): Effie Allen, Helen Brooks, Blanche Edwards, Esther Powers, Hattie M. Redford, Emily Clay, Ruby Rankins, Bessie Martin and Alma Bolen. Sigma Gamma Rho will enter into their 90th year of establishment on November 12, 2012. If was an exciting day in Indianapolis, Indiana for seven school teachers, as they prepared to change black history. Becoming the youngst sorority, of what is now known as “The Divine Nine”, Sigma Gamma Rho believed that their mission would change the world. And it did. There were other key players in Sigma that contributed to the foundation of sisterhood. The Alpha Chapter of Butler University set the tone of “Greater Service, Greater Progress”. The Beta Chapter, originally located in Terra Haute, Indiana, was home of the 5th Grand Basileus – Bertha Black (who served Sigma for 10 consecutive years). The Gamma, Nu and Rho chapters have the unique stories of being established in other cities originally. During the reorganization of the grand body in 1951, these three chapters were moved from their original locations to universities in North Carolina. Gamma Chapter moved from Atlanta, GA to North Carolina Agricultural & Technical State University in Greensboro, NC; Nu from Pittsburgh, PA to St. Augustine’s College in Raleigh, NC; Rho from Bricks, NC to Winston Salem State University in Winston Salem, NC. The Delta Chapter contributed greatly to the sorority by writing the words to the national hymn (released at the 3rd annual Boule in Louisville, Kentucky). Sigma Gamma Rho has expanded to over 500 chapters in National and International locations. ← Scholarship: I’ve Graduated, Now What?